​Kingdom Hearts 3 pre-order is available for fans looking to secure their copy of the game ahead of its release on Jan. 29. Here is everything you need to know about the different versions of Kingdom Hearts 3 you can pre-order. Sora and friends have gathered for the final battle between light and darkness in #KingdomHearts III! Kingdom Hearts 3 is available for pre-order for PlayStation 4 and for the first time on Xbox One. ​There are several editions of the game players can purchase that come with different pre-order bonuses. The standard edition of the game, priced at $59.99, comes with just the game. It is available for pre-order at various websites ​like Amazon (which will come with the Dawn Till Dusk Keyblade DLC), Best Buy, the PlayStation Store, GameStop, and more. Players who want to purchase Kingdom Hearts 3 for their Xbox One can pre-order it digitally through the Microsoft Store. Amazon and Best Buy will give all customers a $10 reward certificate with their pre-order. The deluxe edition will come with a steelbook case, art book, and a collectible pin that features Sora and the game's logo. It will cost $79.99 to pre-order. The Amazon and Best Buy promotion for the $10 reward certificate apply to the deluxe edition, too. For fans who are willing to spend more money on more collectibles, there is a pricier deluxe edition available to pre-order. 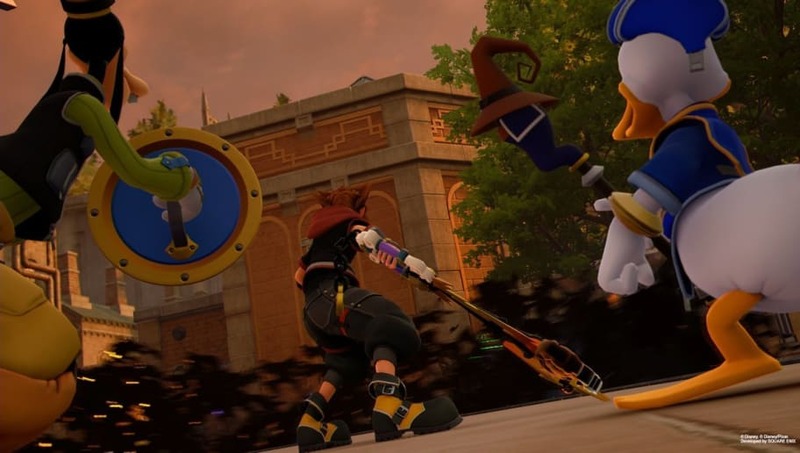 Players will receive the same goodies in the deluxe edition, in addition to figures of Sora, Donald, and Goofy in their outfits from the new Toy Story world: Monstropolis. This pre-order is ​only availa​ble through Square Enix. It will cost $229.99, though at the time of writing, it is sold out. A special bundle available for fans looking to buy a new PS4 with their Kingdom Hearts game. The bundle includes a 1​ TB PS4, Kingdom Hearts 3. It will also come with the bonuses included in the deluxe edition pre-order, without the figures. ​There is also a limited edition Kingdom Hearts 3 PS4 bundle players can pre-order. The bundle includes a Kingdom Hearts 3 and all Kingdom Hearts bundle games for the PS4 -- meaning Kingdom Hearts 1.5 HD Remix, 2.5 Remix, and 2.8 HD Final Chapter Prologue will be included in the bundle. A custom keyblade for Kingdom Hearts 3 and Kingdom Hearts 3 theme for the PS4 will also be included. Kingdom Hearts 3, including all bundles and editions, will be officially released on Jan. 29.